Infographic – How should the election process look? 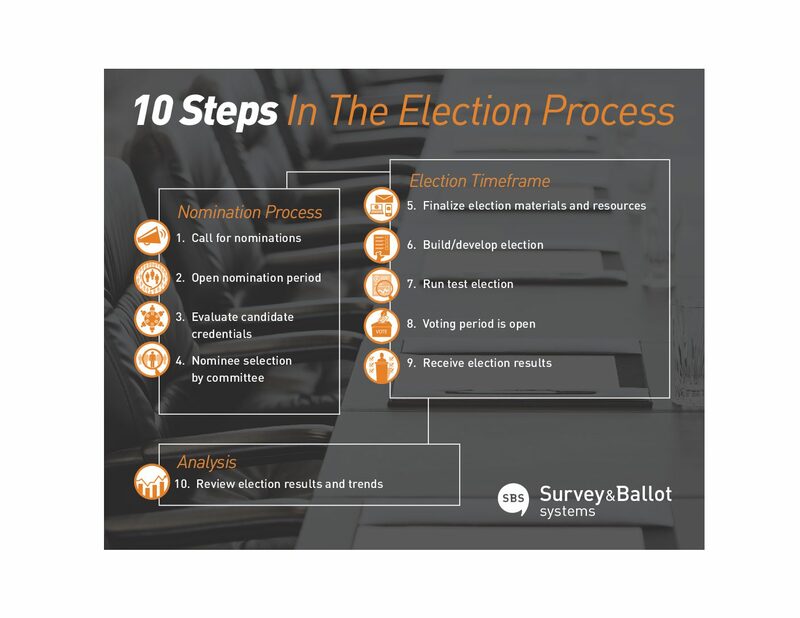 When planning out your election process, there are 10 basic steps that can ensure the event is run smoothly and accurately. Within the election timeframe, there are three main sections: nominations, the election itself and post-election analysis. It is important to take all of these into account when planning, as it is difficult to consistently hold a successful election without comprehensively addressing all three areas. The nomination process consists of a period where the organization makes a call for nominations (either by the candidates themselves or a third-party). The nominees then submit information and are reviewed and approved. This can be a time-intensive step when being handled internally by staff – a nominations platform like DirectNominations™ can save a great deal of time and headaches. From the moment you decide on election materials and resources to when results are delivered, there are important steps to be aware of. These may vary based on the type of election being run (web, paper, hybrid, etc. ), but you’ll always want your election to be well-built and tested before any ballots are ever sent out. That way when you reach the results stage, you know your results are accurate and trustworthy. Post-election analysis of results is a very important step of the election process and should not be overlooked. This is the time to discuss what went well in the election and what could be improved. It may also help to take a deeper dive into your voter response and satisfaction rates to determine if there are any opportunities for growth in the following years. Want to learn more about making the most of your election process? Contact us today!